If you are worried about losing your hair, or have lost some already, chamomile infusion may be just the thing you need. According to Jean Valnet's "The Practice of Aromatherapy," chamomile has special properties that may help prevent hair loss. Despite this claim, there is no conclusive evidence that chamomile is an effective treatment for hair loss or other ailments. Do not use chamomile as a substitute for conventional treatments. Consult your physician if you have questions. Chamomile is an herb that grows wild or cultivated in temperate zones worldwide. Its tiny yellow daisy-like flowers are the active part of the herb. According to "The Illustrated Encyclopedia of Healing Remedies," chamomile flowers are gentle yet powerful for a variety of medicinal treatments. Use of chamomile centers around its properties to soothe and calm the mind and body. It is a common remedy to help with sleep and treat inflamed or irritated skin. There is no conclusive clinical evidence to support these uses of chamomile. Chamomile is also useful in hair treatments. The yellow color of chamomile infusion imparts brightness and shine and lightened the color of hair. Rinsing with chamomile may also help reduce or prevent hair loss, writes Valnet in "The Practice of Aromatherapy." 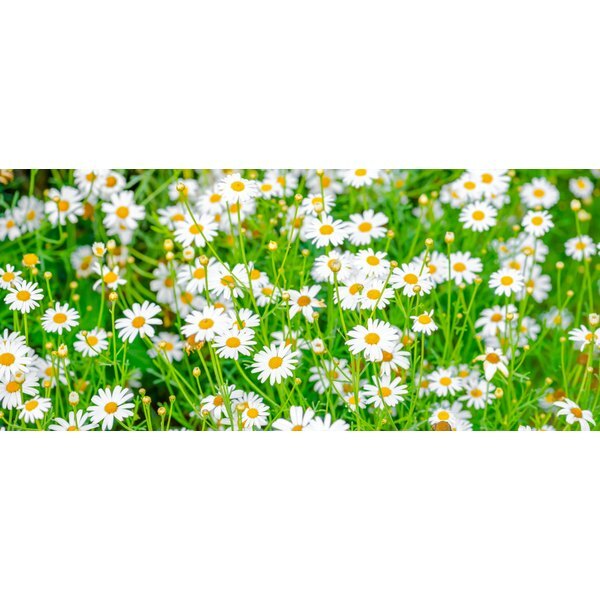 Valnet recommends German chamomile as the best variety for hair treatment. Boil a quart of filtered or distilled water, and pour it over a handful of chamomile flowers. Let steep, covered, for 20 minutes. Filter the infusion through a strainer. Let it cool to room temperature before using. Chamomile infusion will keep for several days in the refrigerator if it is tightly covered. Let it sit out for a few hours or reheat on low on the stove top before using again. After washing your hair, pour chamomile infusion over your entire scalp and hair. Do not rinse it out. Towel dry your hair. It will have a delicate apple-like scent, and your hair may appear lighter. The chamomile may also soothe any inflammation or irritation of the scalp. Chamomile is gentle and safe to use for even children and pregnant women. Some people do have allergic reactions to it, however. Test chamomile infusion on a small patch of skin, and wait 24 hours before using on larger areas. Chamomile has a long history of medicinal use, but there is no conclusive clinical evidence to support use of chamomile for hair loss and other conditions.